Now that Nova Uniao teammate Jose Aldo is no longer ruling the UFC featherweight throne, former UFC bantamweight champion Renan Barao (pictured) has decided to test the 145 pound waters. On Thursday, it was announced Barao will make his UFC featherweight debut against slugger Jeremy Stephens at UFC Fight Night 88. The May 29 event takes place at a yet-to-be determined venue in Brazil. 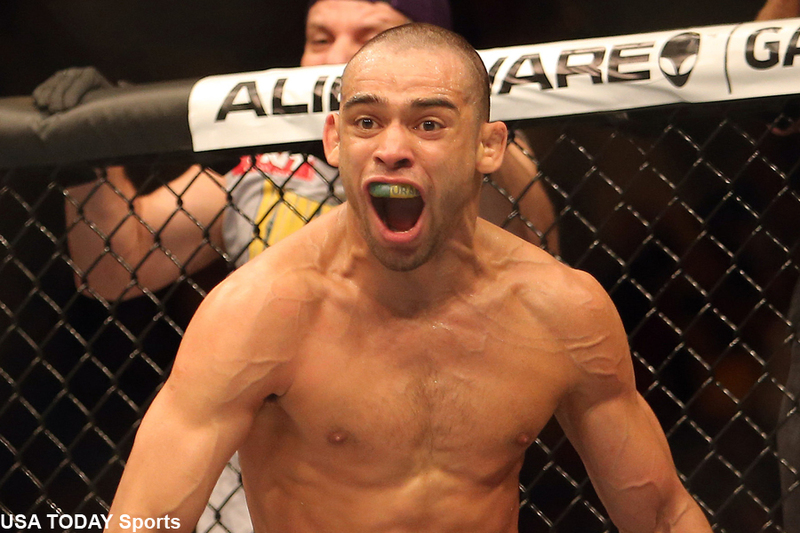 Barao’s move isn’t a complete surprise. He’s had issues on the scale making 135 pounds in the past, most notably when his body went into shock on the day of weigh-ins ahead of his scrap with then-champ TJ Dillashaw at UFC 177 and had to be pulled from the instant rematch. The man UFC president Dana White dubbed the best pound-for-pound fighter in the game prior to getting upset by Dillashaw for the belt at UFC 173, Barao now gets the chance to get his career back on track after losing to Dillashaw for a second time in his most recent outing in July. Stephens, meanwhile, has enjoyed mediocre success at featherweight since dropping from lightweight in 2012. “Lil’ Heathen” has won just four of his seven bouts in the lighter weight class after the transition. The veteran was most recently seen getting out pointed by Max Holloway at UFC 194 in December.